The small town of Templeton, California began in 1886, but it began for me in 1991. For me, until then, it was only three exit signs along Highway 101 between Atascadero and Paso Robles, as we drove from Southern California to my in-law’s home in Carmel Valley. My thoughts while passing through were “Nothing to see here.” Maybe back in those days there wasn’t much to see. I remember stopping at City Park in both Templeton and in Paso Robles on some of those trips, and they seemed pretty ordinary. My perspective has changed when we got off the freeway and started looking at houses. We wanted to live on the west side of Templeton because it gets the cool ocean breezes from Cambria, thirty miles west of where we eventually moved. We had always wanted to live in the country, and we were able to find a parcel of almost fourteen acres on the highway that leads to the coast. The house is only a small converted barn of less than 1,200 square feet, but it appeared to be all we would need then. It had room for my fourteen-year-old son to finally get a horse and a dog. We committed to buying the house the same day we attended a picnic for local home schoolers. My son even signed up for their associated Boy Scout Troop. Three days later he died in an accident. There we were with the house we bought with my son in mind, and he never got to live in it. But we had committed ourselves to buying it, and we did need to be closer to Carmel Valley than we were in Ventura County because my husband’s parents often needed help and we had to travel there. The land is still beautiful. 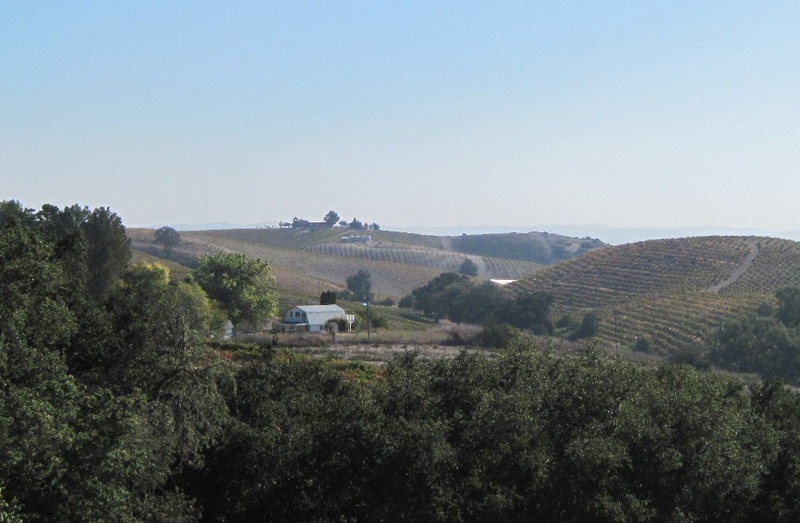 I took this picture of the house from the tasting room patio of our neighbor. His tasting room is on the hill that looks down on us. His vineyard is on the other side of my back fence. The poster below shows the patio near where I took the photo of my house, but I took the photo for this poster looking in the other direction. The house has never really fit the life we chose after Jason died. Why? Because I became a home school vender. We began to travel all over the country to exhibit at home school conventions. We also did book fairs for private schools in California. My house and even a small book shed could not contain all the inventory. We just missed buying a home in Atascadero by twenty minutes. A realtor beat us with an offer after we’d spent a month deciding whether to make our offer. That house had plenty of room for the books and enough land for a horse, but it just wasn’t meant to be. After about three years we stopped this travel. My husband wore out his hips helping me drive the truck and helping me set up and tear down our 10 x 30 foot exhibit space. I then had to take the business online and that’s when the inventory really started to accumulate. That’s a story I’ll have to tell another time. I’m standing in the beginning of the first herb garden I planted in Templeton. Once I started staying home I began more serious gardening. The previous owner had already planted a small orchard, but few of the trees had survived. Templeton is an agricultural community. There have been a lot of cattlemen here and some people raise thoroughbred horses. The most common crop by far, though, is now wine grapes. If you look at the photo of my house above, you will see it is almost surrounded by vineyards. Most of those grapes were planted after we moved here. None of the vineyards are on our property. 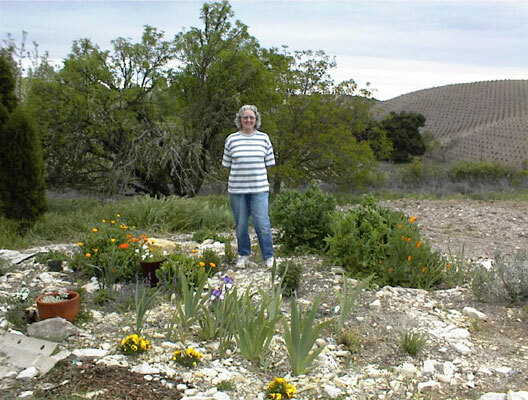 In the photo of me in my herb garden, the vineyard you see is actually across the highway. Templeton has many community events through the year – more than I have time to attend. Probably the most attended event is our Saturday Farmer’s Market in Templeton. It’s one of the largest in the county, even though we are a small town – not even an incorporated city. We have a great selection of produced, handmade crafts, and locally produced foods available to us every Saturday. I could probably write a book about Templeton, its events, and its scenery and wineries. Maybe someday I will. As this blog progresses, I’ll show you more – not only about Templeton and the other cities in our county, but also about more California places, including Santa Barbara, Orange County, Los Angeles, Yreka, Simi Valley, Thousand Oaks, Carmel, Carmel Valley, Monterey, and anywhere else I go. Stay tuned. Which California places would you like to know more about? Which California places have you visited? Do you prefer the coast cities and their beaches? Orange County with its many theme parks? The small towns and agricultural communities? The mountains? Wine Country? California has it all. All images used in this blog taken by me or my husband unless otherwise specified. All content is written by me. Neither images or content may be used elsewhere without my written permission. This post was previously published on BlogJob.com on October 1, 2015, which is why comments may be dated earlier than the publication date of this post. Well fear not @barbrad as I am here now, RFLOL. Gorgeous blog post, especially the photo of you in your garden. I cannot look at it without remembering your yummy Serbian tomato salad. Too bad I wasn’t able to grow any veggies this year. Neck surgery convalescence limited what I was able to do in the garden this year. It was about all I could do to keep things watered. I would love to see that book at Amazon. I love reading local memoirs. Linda, Thanks for the vote of confidence, but I’m not quite ready for the book yet. I always enjoy your articles. Glad you are back to sharing these places with us. Thanks, Olivia. I’ve many more to share. Thanks for stopping by. Lynne, It’s very dry here. Water is rationed for landscaping. It’s also fire season here, so we have to be very careful. Congratulations on the loss of your new blog. You do have a story to tell. I know it’s been said before, but I am so sorry about the loss of your son, what a horrid start to a new life. I look forward to reading more. I lived in California for about 15 years. Thank you, Rhonda. Jason’s death did delay our total move here for a year, since we needed the support of our church family back in Newbury Park. It took time to develop new friendships with those who never knew him. It looks like you are thriving in your chosen location now. I hope we won’t be taxed out of California. It’s prettiest after the winter and spring rains. Sorry to hear about the loss of your son. I look forward to learning more about California. Thank you, Sandy. We so still miss him. Always will. I do hope to share my further California adventures. That’s a very picturesque area you live in. When I look out my front window I see a row of houses less than 50 yards away! I pretty much see that across the street from where we live in Paso Robles, but at least we have a lovely oak there.